How most coffee drinkers look without coffee, or caffeinated energy snacks. Call of Duty: Black Ops was released on November 9, 2010 for the Wii. The game was developed by Treyarch and published by Activision, and received an ESRB rating of "Mature" with "Blood and Gore, Intense Violence, Strong Language" listed as content for parents and games to be aware of. This past November, we took a look at Call of Duty: Black Ops' reported play-time over its first year on the Wii. It had already racked up over 10 million hours, and had become the most played FPS Wii game in the United States, per Wii owner, according to the reported data. 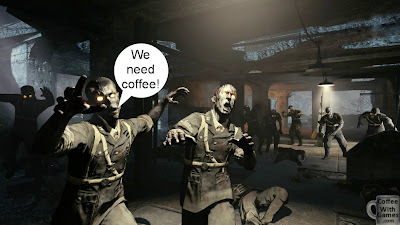 How many hours have Wii owners reported playing Black Ops in the last 7 months, perhaps spending many of those hours battling zombies? Brew some coffee on this fine day, and let's take a look! Call of Duty: Black Ops now has approximately 177,173 U.S. Wii owners that have reported data through the Nintendo Channel, which is an increase of 43,012 U.S. Wii owners that have reported data since November 21, 2011. The game has an average play-time per day/session now reported of 2 Hours 38 Minutes, a 6 minute decrease over the last average per session reported. The game's average hours reported "Per person" now being 81 Hours 53 Minutes is 3 Hours 32 Minutes higher than the last reported average. Black Ops' current 14,506,333 Total Hours of reported game-play data is an increase of nearly 4 million more hours in the last 7 months. Call of Duty: Black Ops on the Wii has a "professional" review score average of 81.47%, based on 17 reviews on GameRankings.com. The game's customer review score average is 76.88% though, based on 135 customer reviews from Amazon.com. I mentioned in an older post, "Based off the play-time data currently reported for CoD:WaW, I think it will be the Wii's most reported played FPS game, until the next Nintendo console is released." I thought Call of Duty: World at War would be the Wii's "most played" FPS game with "Total Hours" reported until Nintendo's next console released, that we now know as the Wii U this holiday season, but seeing the number of hours Black Ops has been increasing, it may very well become the Wii's most played FPS game "Per person" and with "Total Hours" reported in the U.S., before the Wii U releases later this year. Have any of you been playing Call of Duty: Black Ops on the Wii, or even PS3 or 360, regularly since it released? Is the Zombie Mode one reason you keep returning to the game, or just the regular multiplayer? If you are a fan of the Call of Duty series in general, but perhaps don't purchase every single game for the series that releases, do you plan on purchasing Black Ops 2 when it releases later this year? "How most coffee drinkers look without coffee, or caffeinated energy snacks." Did you notice a few of the poor saps in the picture had already passed out from, I guess, an apparent lack of coffee? I spotted at least four catching naps on the ground. Black Ops has always been a fan favourite in the Call of Duty series, so I'm not surprised that it did that well on Wii, even though it is, at the end of the day, Wii. "Seems that not all Call of Duty fans hate the Wii, then." Not at all. While you definitely have people that just hate the series in general though, but that can be applied to many series. Wii, or not. Call of Duty: World at War Wii is my most played Wii game to date, because of the game's great single-player campaign, and it's super addictive online multiplayer. 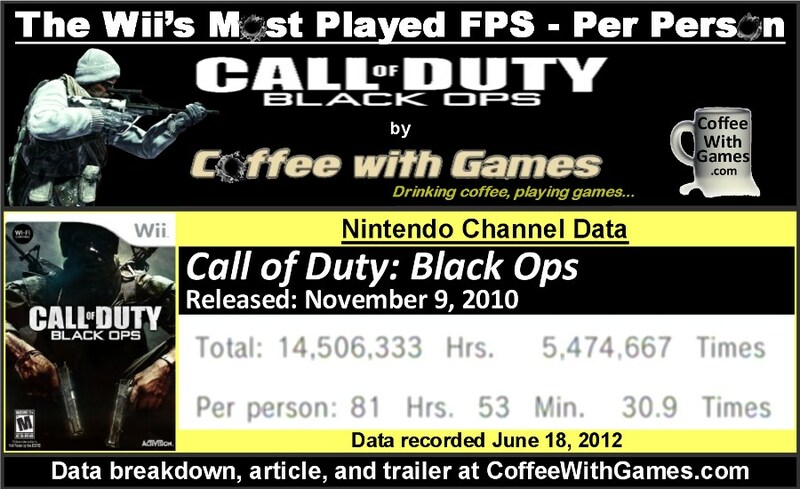 The Call of Duty games have had a very good track record on the Wii with the number of hours reported played. I don't know about you, but I know a few people who 1) only play Call of Duty and 2) hate the Wii because of power/graphics/reputation for being a casual console. That said, 99% of Call of Duty fans don't mind the Wii at all, and enjoy the series (like you). But you can't please everyone, as Reggie has said himself. "But you can't please everyone, as Reggie has said himself." LOL. After the E3 and Nintendo Direct showings, NOA isn't even needed from what I can tell right now. Just repeat what NOJ says, and put out a press release. Reggie = Puppet, and puppet master...at least he admitted to one publicly so far. 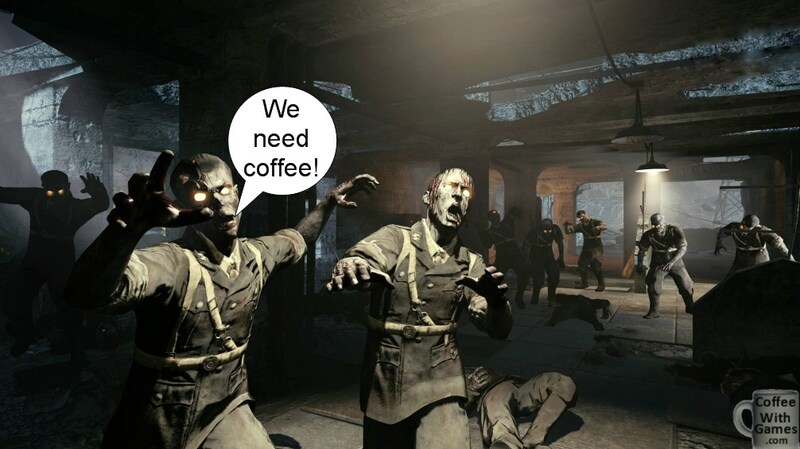 lol, no I didn't, but they surely have zombified and passed out due to lack of coffee. That was truly me this morning where I forgot to close the lid and turn the pot on. "That was truly me this morning where I forgot to close the lid..."
"...and turn the pot on." So, coffee and water were ready to brew, but the only thing lacking was the power button in the right direction? That's me if I stop moving, it instantly happens. That's an obscene average number of hours - some people must have played literally 1000 hours to hit that average. I'm no great fan of Call of Duty, though I must admit I prefer FPSers in general on PS3 - the Dual Shock is simply more comfortable for me. Good to see the series does get Wii support. The numbers might not be as high as the other consoles versions, but we'll see if Activision considers the numbers high enough to throw adequate resources on the Wii U version of this year's game. I usually take a few months in between covering games with data reports. Fortune Street was covered just last month actually, remember?